SOCHI, Russia (AP) — FIFA’s new video review system is bringing turmoil to the Confederations Cup, with technology designed to deliver quick, clear decisions agitating players and leaving coaches and fans confused. Perhaps even worse for FIFA, the latest controversy on Sunday — exactly one week after four goal reviews in that day’s two matches — made one of the world’s highest-rated referees look hesitant and wrong. Wilmar Roldan sent off a Cameroon defender more than three minutes after a high tackle on a German opponent and only after his own case of mistaken identity. 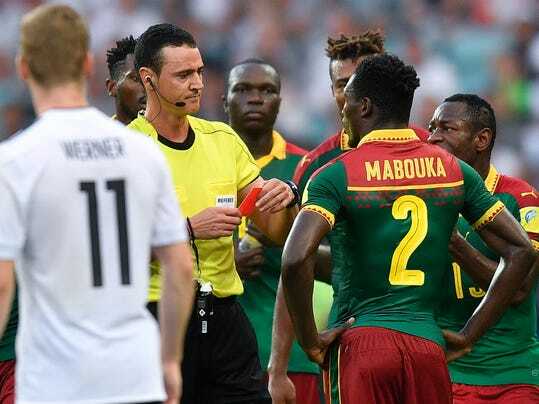 The Colombian official arrived at what was arguably the correct decision following two visits to the touchline to consult video replays and first showing only a yellow card, then a red card, to the wrong Cameroon player.